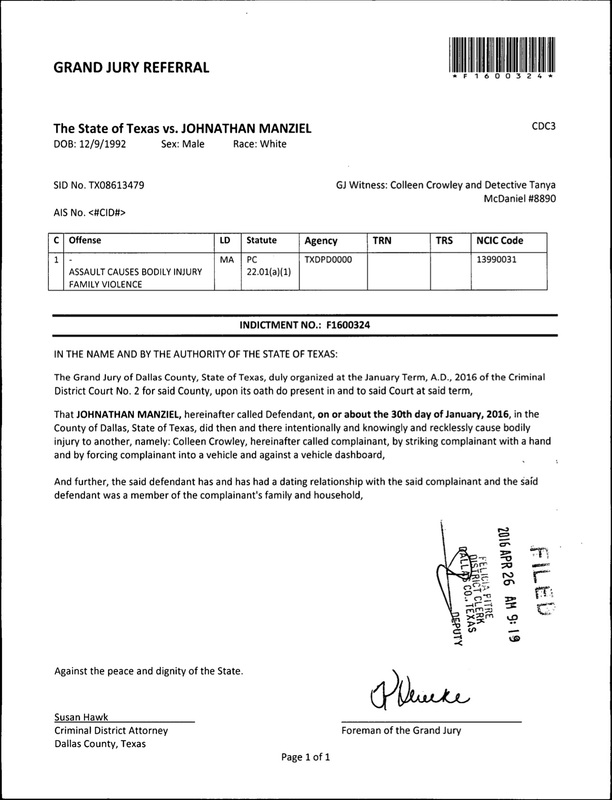 The official document showing the indictment of former Browns quarterback Johnny Manziel was released Tuesday. Manziel, a Heisman Trophy winner at Texas A&M, was indicted after he allegedly hit his ex-girlfriend Colleen Crowley so hard that she temporarily lost hearing in one ear. Crowley requested and was granted a protective order against the 23-year-old quarterback that prevents him from seeing her for two years. She says she and Manziel had a confrontation in a Dallas hotel room, which continued downstairs at the valet station. She said he forced her into a car and a valet ignored her pleas for help. The two drove to where her car was parked in front of a Dallas bar, she said in an affidavit. She accused Manziel of getting into the driver's seat and beginning to drive. She says when she tried to jump out of the car, Manziel stopped, dragged her back into the car and hit her. Police said they had spoken to Crowley, interviewed several other witnesses and reviewed medical records. But they did not arrest Manziel, instead taking the unusual step of asking the district attorney's office to present the case to a grand jury. Manziel was cut by the Browns in March after two tumultuous seasons marked by inconsistent play and off-the-field headlines about his partying and drinking, including one stint in rehab. His future in the NFL is uncertain at best, and might be nonexistent without a second stint in treatment that two agents have demanded. The little time Manziel spent on the field for the Browns the past two seasons, he didn't have much impact. He passed for 1,675 yards with seven touchdowns and seven interceptions in 14 games. And his admission after his rookie season that he didn't spend enough time preparing will be another factor in any team's decision to pick up Manziel. Cleveland delayed the quarterback's release for two days trying to find a trade partner, but Manziel's value has declined since his days as a dynamic playmaker with the Aggies.